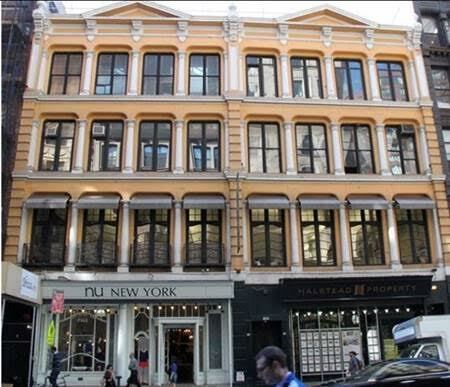 The NYC Landmarks Preservation Commission (LPC) has scheduled its hearing on the proposed landmark designation of 827-831 Broadway for Tuesday, October 17th. It will take place at their hearing room in the Municipal Building, One Centre Street, 9th floor, during business hours (exact time will be announced the Friday before). We’ll need a strong show of support, so please attend if you can, or send a letter of support! 827 and 831 Broadway are a pair of 1866 cast-iron loft buildings which GVSHP has fought to get landmarked. Slated for demolition and replacement with a 300 ft. tall tower by their new developer owners, GVSHP was able to document evidence of their incredibly important role in 19th century commerce and the 20th century art world, including housing Willem and Elaine de Kooning, Paul Jenkins, Larry Poons, Jules Olitsky and William S. Rubin – read our research here. After our landmarking request was initially rejected, GVSHP compiled additional research and support, and continued to push the LPC to reconsider. On September 19th, the LPC voted to begin the process of considering the buildings for landmark designation, affording them preliminary protections in the interim. The LPC may vote on landmark designation on October 17th, or they may wait.